Marketing across international borders is an extremely difficult venture and it can be very costly if a business fails to cover all the aspects and prepare a detailed plan. 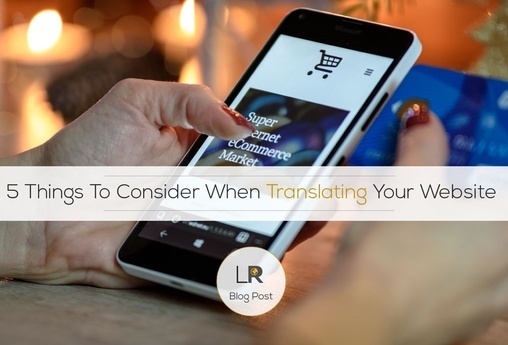 Although it may not seem immediately vital, one of the key tasks to consider is translating your website into the native language of a market you intend to target. Around 75% of people prefer to buy products from websites which are written in their native language. Neglecting to translate your website into the language of your target audience, therefore, is simply something a business cannot afford to do, especially within a new, international market. Often, business owners turn for help to free, online translation programs, such as Google Translate. However, it’s important to bear in mind that translation is not only about changing the words. It is equally important that you use local words, idioms and cultural references, based on cultural and socio-economic factors. To translate your website effectively, you should be looking towards professional linguists who not only specialise in translating marketing content, but are also native speakers of the language your target audience uses. Nobody will be able to understands your audience better than someone who is not only an expert translator, but also ticks all the boxes for a potential customer. Languages are incredibly complex. Translating from one language to another involves far more than simply plugging the text into one of the free online tools such as Google Translate. Translations often involve emotions and understanding a particular culture and target audience. As a matter of fact, machine translation tools, although improved significantly over the recent years, are still behind the capabilities of humans when it comes to comprehending languages. For example, if you have a slogan that relies upon a cultural reference, joke, or idiom in your native language, this is going to be very difficult to translate into other languages. It is often the case that there is no direct correlation in other countries and the meaning will be totally lost unless a reliable localisation service is applied. If you want to see how advertising slogans can go horribly wrong when they are translated literally, check out these hilarious mishaps from recognised brands. Whatever your original content looks like, you need to adapt your language rather than just translate it word for word – and this is where a professional website translator with experience in marketing pays dividends. There are also practical considerations to consider. Dates are written differently in different regions (even between the same language, as is the case with the USA and the UK). This can cause confusion when there is a deadline to an offer – so it’s important to make sure you get all the details right. When you create web content in your original language, you will probably pay attention to keywords to help improve your SEO. You should also do the same when you are targeting an overseas audience. Most people conduct searches in their own language. You can’t ignore SEO when you translate your website. Keyword research is just as important if you want your site to rank highly and increase visibility in a different region, otherwise you could go to all the effort of translating your website and not get any traffic. This means researching your keywords in your target language. If you don’t have any experience in your target language, use the services of a native speaker with knowledge of both the language and SEO. They will also be able to seamlessly and strategically place the keywords within the translated content. Furthermore, don’t forget that Google is not the only search engine. Some countries prefer other search engines or have even created their own to suit their complex language. In China, for example, Baidu has 80% of the market. Vietnam has also designed their own search engine, called Coc Coc. How your website looks and how easy it is to use are important considerations in any language. In the context of translation, this mainly relates to the appearance of the content on the page. If you are translating your original content into a language that ends up using more words, this could cause design issues. What if part of the content referring to an image is further down the page? This will cause confusion for readers. Make things easier by creating your original content with future translations in mind. If you know that you will be translating it into a language like German (that typically has longer words and expressions than English), use a simple design where it does not matter if the copy takes up more space. If you create a web design with strategically placed images or widgets that requires a precise amount of characters to get the alignment right, it becomes very difficult to translate into another language. Menus can also pose a problem. Short category names in English might not be so short in another language. This is something that a skilled translator with experience in marketing can help you with. Finally, check the translated copy to make sure it all makes sense in terms of where it goes on the page. Whilst it is important that your website looks great, its equally critical that the navigation is intuitive as well. Branding can pose all types of problems when you are targeting an overseas audience. Because of the cultural differences, the branding you use at home may not be appropriate for a foreign audience. Even something a subtle as colour can have a different meaning in another country. When you translate the content of your website, ensure your branding is geared towards the audience you are targeting. Although you should be able to retain your brand personality, you may need to make a few tweaks to the voice. For example, in the UK and United States, call-to-actions are firm and compelling. However, this does not work for every type of audience. In France and Germany for example, marketers use a softer approach that coax the consumer. Finally, make sure you also translate your multimedia content. Many websites now use images, videos, slideshows and infographics, to give pages a visual impact and make it easier for mobile users to engage in content. These all need to be translated. Always make sure that your multimedia content is not only translated but that it is also appropriate for your target market. If you’re publishing a video should you use subtitles, or voiceover translations? Different markets have different expectations. Images should be culturally relevant. They should make sense in the territory you are aiming at – but should also be culturally appropriate. Play it safe by avoiding specific cultural references in images which are hard to replace. And don’t make the mistake of using stereotypical props. Create a style guide and a glossary and share this with everyone involved in localising your website to keep the terminology consistent. Use responsive design for your website because this will help to make your site more flexible when translating and you won’t have to worry about the device preferences in different countries. Keep the design simple but powerful because this will make it much easier to translate. Always double-check the final result by hiring a native speaker to go over it and check not just the language but the overall look and navigation to highlight any issues that need changing. Legal issues are also important. Some territories have rules that you need to be aware of, such as issues that cannot be mentioned, marketing techniques that are not permitted or privacy laws regarding the collection of data from visitors. As you can see, website translations go a long way beyond simply changing the words. There is a lot that goes into language translations, and getting it right is essential for creating a successful version of your website for a foreign audience. If you need to translate your website, but aren’t entirely sure how to get started, get in touch with one of our team members for advice.